The cuisine of the La Palomba restaurant in Mondavio is female and originally! There is a wide selection of appetizers including the Palomba Starter, much loved by our customers. Our pastes are hand-worked and rolled with a rolling pin. You can taste the typical "tacconi allo sgagg", a traditional local dish, mixed with bean curd and seasoned with lard and garlic. As well as passatelli with truffles, to continue with long pasta (pappardelle, tagliatelle), delicious gnocchi with duck. To finish with stuffed pasta: tortellini, tortelloni, ravioli in addition to the inevitable cappelletti in broth. Among the latter you can taste our roasts and grilled meats. In addition, the cold cuts with the inevitable piadina of Marche region's. When it is season, we cook for you truffle-based delicacies, porcini mushrooms, wild boar and game dishes. On reservation: goose and rabbit in porchetta. Vegetarians will find an irresistible selection of pecorino cheeses, aged in the home according to the ancient farming traditions using walnut, ash, pomace, and hay leaves: products also awarded by Slow Food. Also a great choice of salads and side dishes of the season with zero-km vegetables that come directly from our gardens. The farming origins of the Cerisoli Family have allowed us to keep alive the love for the products of the earth, this strong bond is reflected in the foods and products that we offer every day, starting with the "Benedett'Oli" EVO oil of our own production. The family management of the Albergo Ristorante La Palomba also means attention for those with special needs: you can request dishes for celiacs or communicate intolerances: we will be happy to allow everyone to enjoy our dishes! 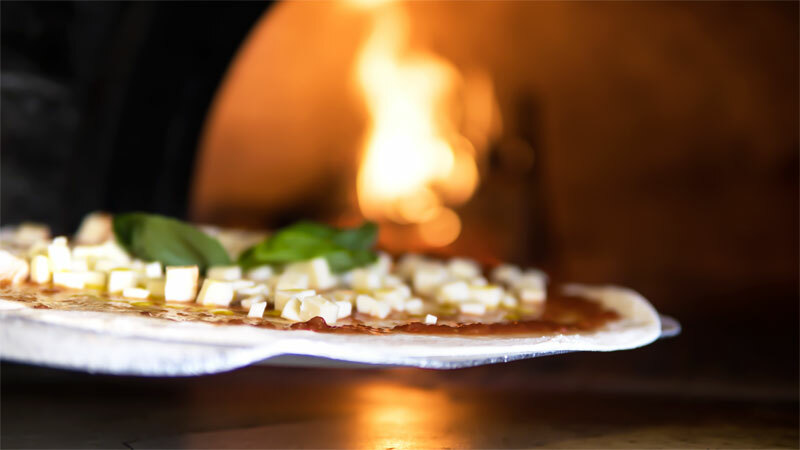 From Thursday for lunch to Sunday for dinner, La Palomba is also a pizzeria with a wood oven. In addition to the classic pizzas, we adhere to the project "Pizze delle terre of Rossini and Raffaello", stuffed using products d.o.c. and d.o.p. of the territory like the oil of Cartoceto, the beans of Fratterosa, the ham of Carpegna and the Casciotta of Urbino. Possibility of gourmet pizzas with wholemeal dough, cereals and hemp. For a minimum of four people the possibility to choose the tasting of special pizzas paired with local craft beers. New: For those who do not want to give up the pleasure of our kitchen without moving from home, we offer catering and take-away service.